Xuankong , or Hanging Monastery, lies 5 kilometers east of the city of Yang- yuan, between the two peaks of the Beiyue- Mountains. The monastery has a history of more than 1,400 years. About 40 buildings survived are scattered halfway up the mountain on the cliff face or slopes, from 26 to 50 meters above the foot of the mountain. 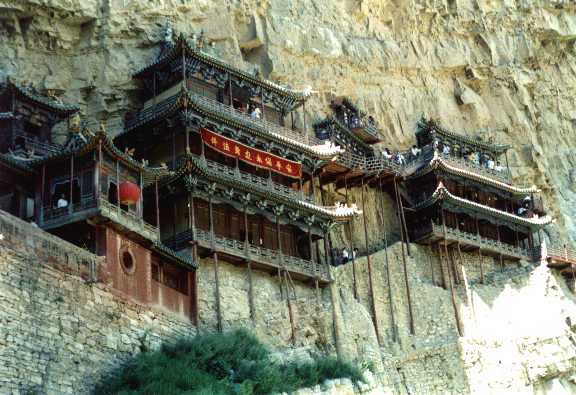 The monastery buildings which seem to be hanging in midair on the cliffs are unique in structure. Within the monastery are numerous pictures and 78 color statues made of copper, iron or stone.